Enjoy life outside in a custom swimming pool & spa! From La Habra to San Clemente, homeowners can take advantage of the quintessential So-Cal lifestyle, relaxing and playing in the virtually year-round sunshine. That’s why nothing beats a custom pool & spa for extending living space to your exterior property. Our construction team can create a state-of-the-art staycation backdrop for your whole family. And along with splashing, relaxing, and swimming, you can expand activity options with additional amenities such as a patio deck, fire pit, island grill, or outdoor kitchen. For swimming pool construction, you want a contractor you can trust. Born in Southern California in the 1950s, the Blue Haven Pools name has been synonymous with sun-splashed fun for decades. Our Diving Lady logo adorns thousands of pools throughout the Golden State—with tens of thousands more across the nation. 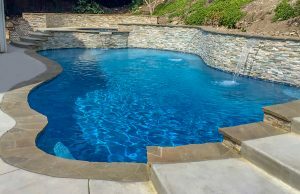 With a concrete (gunite/shotcrete) pool design, OC homeowners can have a visually appealing, custom aquatic creation in any size, shape, or style. You can also add design and functional options such as fire bowls, tanning ledges, bubbler fountains, and rock waterfalls. Along with a custom pool & spa tailored to your backyard and aesthetic preferences, your Blue Haven retreat will boast technology innovations. 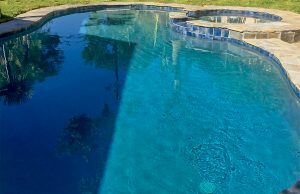 Here in Orange County, we continue Blue Haven’s long tradition of using the latest industry advancements that bring greater value to pool owners. High-efficiency heaters with low NOx emission levels (meets California air quality regulations). Planning a new pool and outdoor living area can be a daunting task. Buyers have so many decisions to make about so many different elements. Looking at pool photos can help, but new technology makes the process easier and more meaningful. Imagine seeing your new backyard resort before signing off on its final design. With our special 3-D software, you can. This multidimensional rendering will illustrate the potential your backyard holds when you add a pool, deck, and related patio amenities. Being able to view your pool in virtual reality will help you make final choices on project elements ranging from dimensions to placement of decorative features. To enjoy open-air leisure and at-home entertaining at its best, get started on a new custom pool. 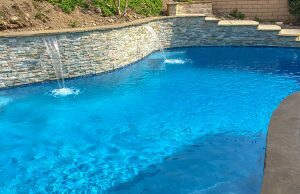 We are happy to schedule an appointment for a free in-home pool estimate and design presentation. If you would like to consider financing, you can get a jump start on the process prior to scheduling a pool consultation: Simply complete this free online loan pre-approval form.